Choosing the right gown for your wedding is essential. When marrying your true love you should feel beautiful and confident from the inside out. 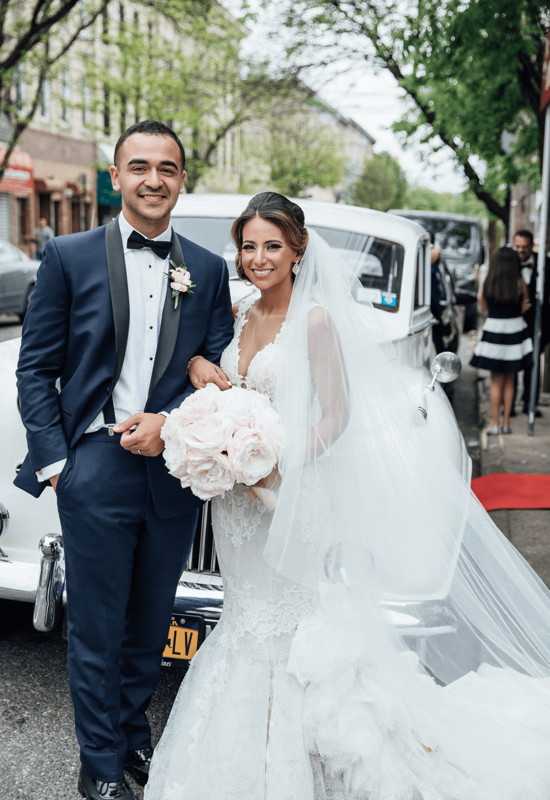 When it came time for Amanda and Morcos Hanna to wed on April 30, 2017 at the St. Mary and St. Anthony Coptic Church in Queens, Amanda knew she had made the right choice. The journey to finding the ideal wedding dress was full of ups and downs for Amanda. Amanda was looking for an elegant, fitted mermaid gown with a long dramatic train for the “wow” effect. 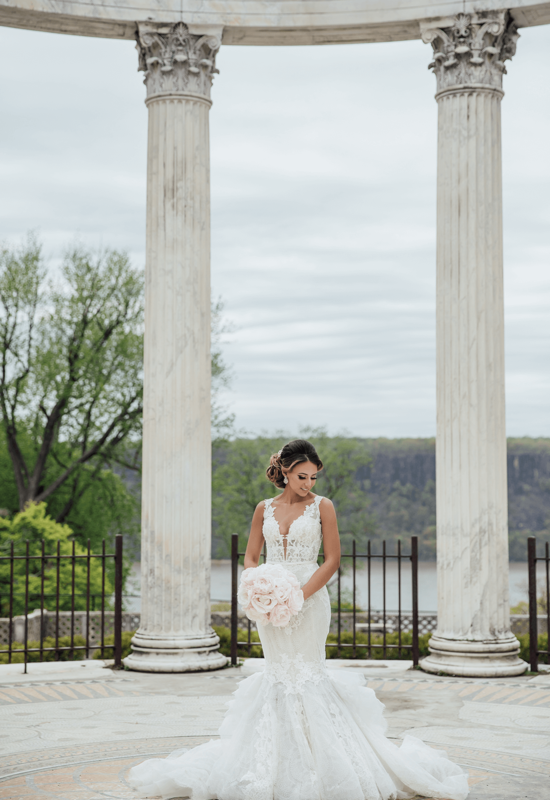 Unable to find what she was looking for at other bridal salons, Amanda decided to visit Kleinfeld Bridal in search of her dream wedding dress. Trying to follow the golden rule of staying within her budget, Amanda began trying on gowns. 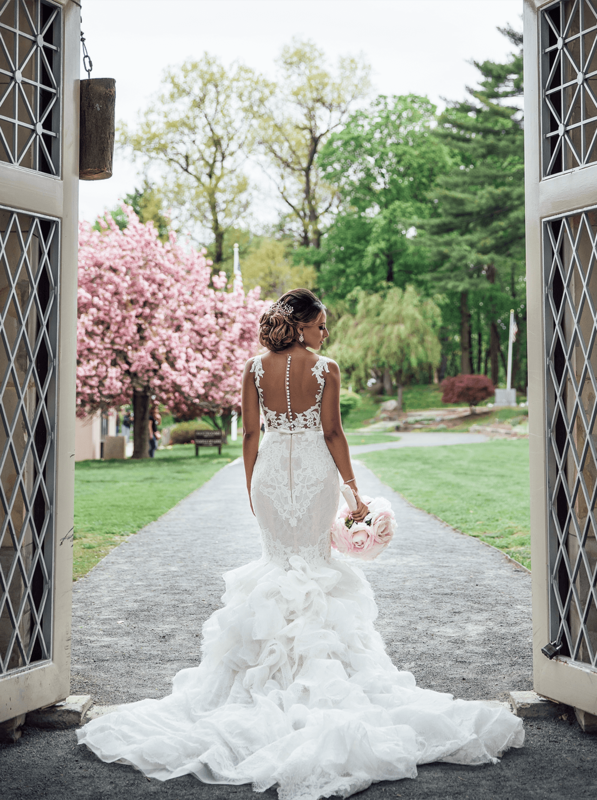 Her stepmom, however, couldn’t help but pull for Amanda a gorgeous gown from the Pnina Tornai Boutique that she felt the bride-to-be would love. It was a fitted mermaid gown covered in exquisite lace with a sweeping ruffled train. Amanda tried on the gown and walked out into the salon to show her family. Amanda had fallen in love with the gown. However, the gown was not in Amanda’s budget so she decided to instead purchase another gown. While looking at pictures of herself in the gown she had just purchased, Amanda knew she had made a mistake. A few days later Amanda called the salon and told them to cancel the dress she had purchased. Amanda was ready to say yes to the gown her heart had fallen in love with. 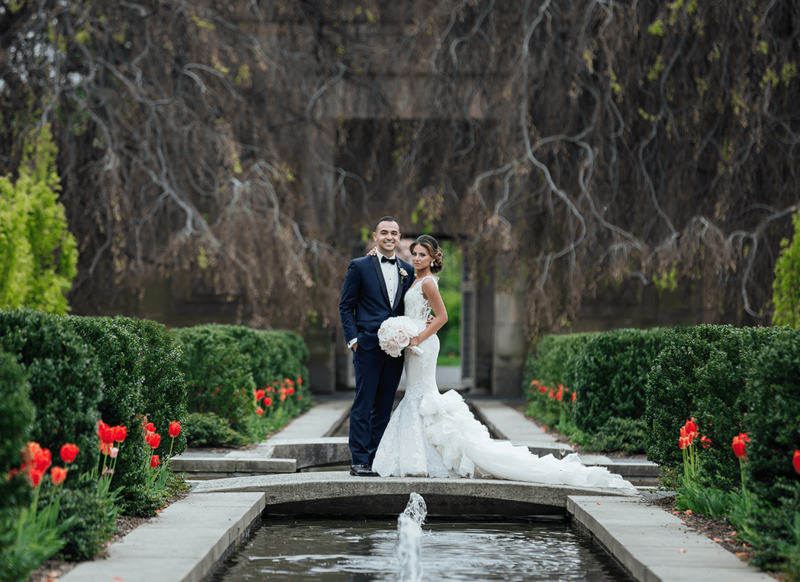 On her next trip back to the salon when Amanda actually purchased her stunning new wedding dress, she got to meet her gown’s designer, Pnina Tornai. Amanda sat down with Pnina and they discussed how she could make small customizations to the gown to really make it her own. Amanda decided to raise the back of the gown a bit to have a more traditional look and instead of having the open neckline, she changed it to all illusion material instead. Later, Amanda also added buttons to the back of the dress and more lace on the back of the gown as well. It was the classic and elegant gown that Amanda had been dreaming of. 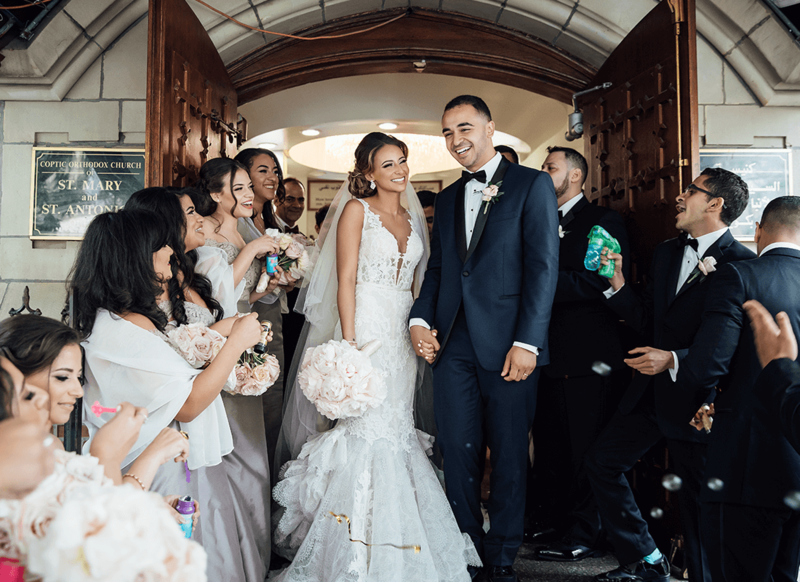 To make everything even more special for the bride, Pnina gifted Amanda one of her cathedral length veils that flowed perfectly over her dramatic train. To round out the whole look Amanda wore dazzling chandelier earrings and wore her hair up to show off the elegant buttons on the back of her gown. In the garden of the church before their big ceremony, Amanda and Morcos had their first look at each other. 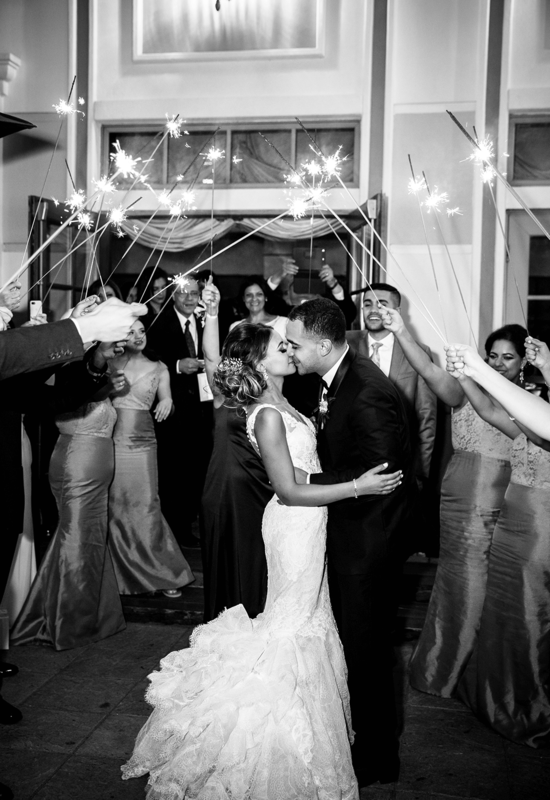 With his bride beaming in her amazing gown, Morcos said three words that let Amanda know she had chosen the right one: worth every penny! 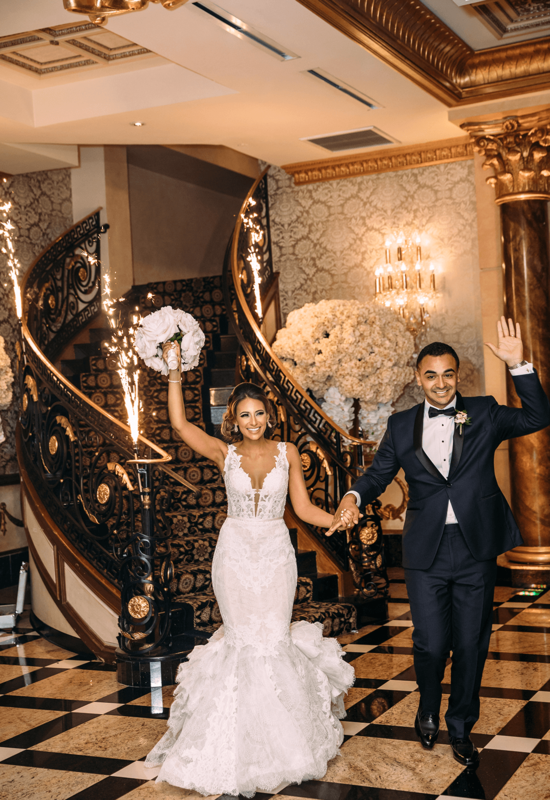 Perfect for their church wedding and their grand reception at the Venetian, Amanda wowed her new husband and their friends and family in her eye-catching masterpiece.